Federica graduated from Perugia University (Italy) and worked in small animal practice in Italy following her graduation in 2010. As she enjoys travelling and experiencing different cultures, Federica set herself the goal of seeking to continue her professional development abroad. This took her to the UK in July 2013, where she joined the Bath Veterinary Group as a hospital veterinary surgeon. 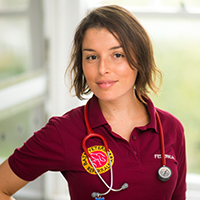 Federica continued her studies with a Post-Graduated Certification in Small Animal Medicine in 2016. She then joined Bath Referrals in February 2017. Federica completed her certificate in Advanced Veterinary Practice in February 2018. Federica's main interests include internal medicine and diagnostic ultrasonography.